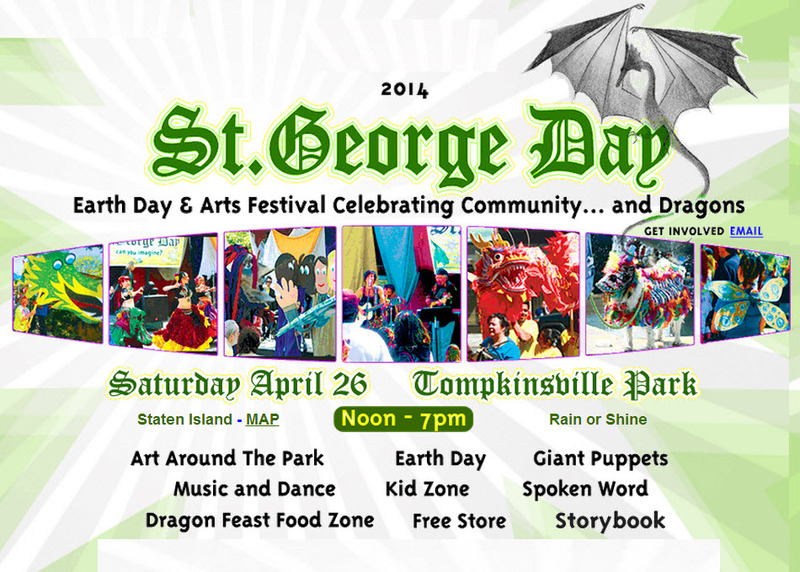 The St. George Day Festival, a local Earth Day and Art celebration, will take place Saturday, April 26, 2014 from Noon to 7pm in and around Tompkinsville Park in Staten Island New York City. This free, event across from the Staten Island ferry is a community pageant, performing arts showcase, literary event and interactive science fair and will include childrens activities, family-oriented fun, outdoor art installations, live music, street performance, crafts and Earth Day demonstrations. Three of St. George Day’s signature offerings, the Earth Day Zone, the Festival Dragon Parade, and the giant puppet spectacle,“St. George & the Friendly Dragon,” will again be presented. An Earth Day event like no other, the festival invites visitors to imagine the possibilities of what their neighborhood can be when bonded by a deep commitment to the arts, humanities, and the environment. For more details, visit www.stgeorgedaysi.com.